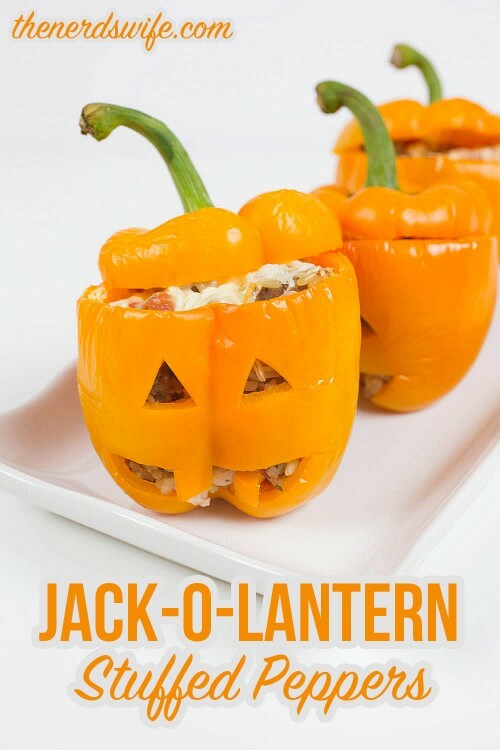 This Halloween, serve a fun and juicy dinner that your kids will love — like these Jack-o-Lantern stuffed peppers, marinated in our very favorite Juicy Juice 100% apple juice! We’ve partnered with Juicy Juice to bring you this yummy Halloween themed dinner. Our family has a tradition where we dinner together and then head out trick-or-treating on Halloween night. It’s so fun and something that we all look forward to. The secret to a flavorful stuffed pepper isn’t just in the filling. There’s an extra step to ensure your peppers come out juicy and delicious every time, and we’re going to share it with you. In a large skillet, cook the Italian sausage and onion over medium-high heat until cooked through. Stir in the garlic and cook another three minutes, until fragrant. Add the tomatoes and rice and stir to mix. Prepare the peppers by slicing off the top and removing the seeds and lining inside the peppers. 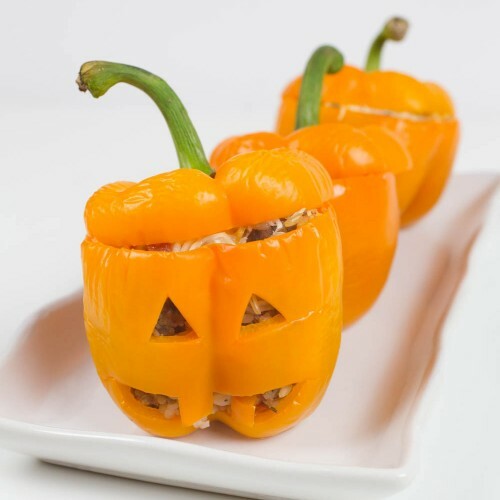 Use a paring knife to cut a jack-o-lantern face into the front of each pepper. 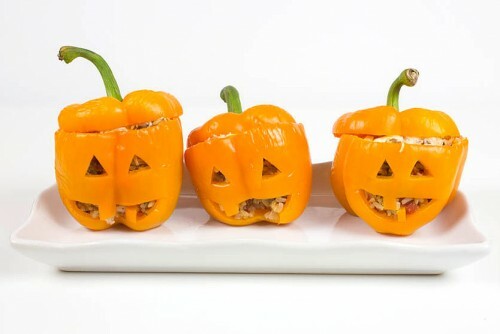 Place the peppers in a baking dish and use a spoon to fill the inside of each one with the rice and meat mixture. Top with shredded parmesan cheese. Pour the Juicy Juice 100% Apple Juice into the bottom of the baking dish. 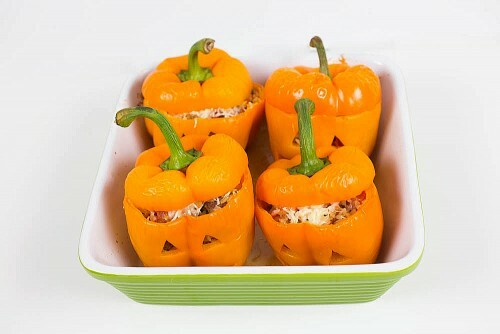 This additional step will add delicious fall flavor to your stuffed peppers and ensure they are moist and delicious! Cover the baking dish with foil and bake for 30 minutes. Remove from the oven, add the tops of the peppers to the melted cheese and bake for an additional 15 minutes. 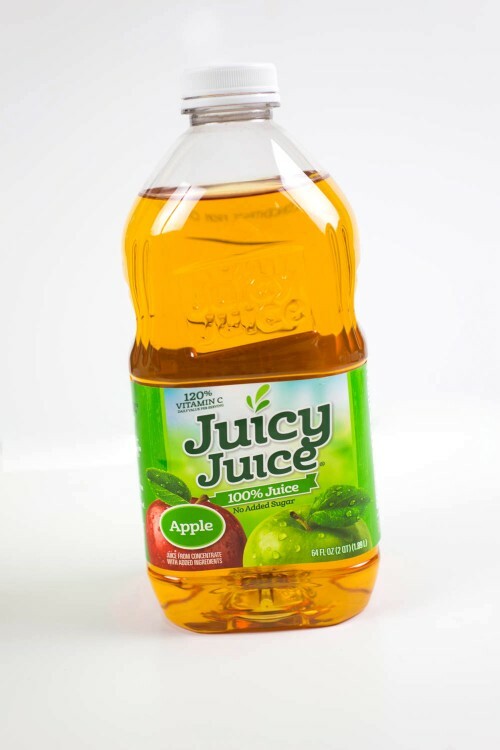 Connect with Juicy Juice on Facebook, Twitter, Instagram, and Pinterest for even more fun ideas!